I love cruises. I love cruise ships. If you ask me about the perfect vacation, I don't hesitate to answer: Go on a cruise! I've been on 25 cruises and counting. 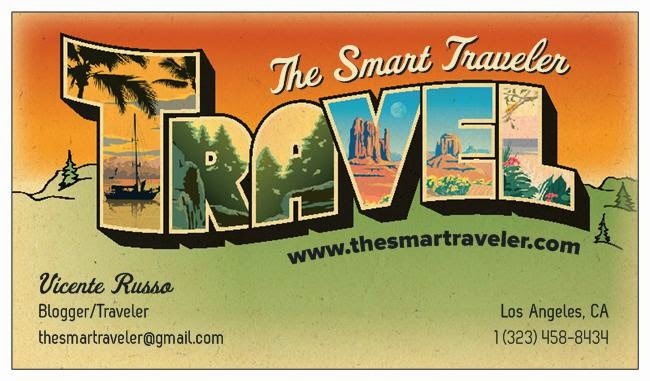 I'll blog a lot about cruises, destinations and deals, but today I want to talk about my first time. Who can forget it, right? This fine liner was launched on November 21 1964 and was delivered to Linea C on August 22, 1966 and duly departed for her maiden Trans-Atlantic voyage from Genoa to Buenos Aires. Her twin turbines gave her a remarkable speed of 27 knots, shortening crossing the Atlantic considerably. She accommodated 178 first class passengers, 356 second class and 1102 tourist class. With her many modern features in all classes, she became a popular luxury liner, much was sought after by the rich and famous. But at that time, Eugenio C was the biggest liner on Earth and the most luxurious. Linea Costa was an Italian operated company (today it belongs to Carnival) so, the crew was all Italian and the food... oh, the food was fantastic. A chef would cook your meals tableside. I remember eating the best "spaghetti al vongole" I ever tasted! And they even sang the tarantella during your meal! It was a cozy, yet sophisticated ambiance and during that long journey we felt welcome and at home. Eugenio Costa was sold in 1999 to the Bremen Vulkan shipyard in part exchange for the Costa Victoria. 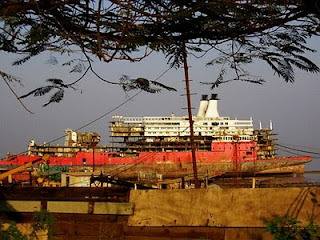 The new owner turned her into the Big Red Boat II and sadly in 2005 this magnificent ship was sold to Indian breakers. This once great liner is coming to the end of her life, a sad sight! Those 30 days aboard were a life changing experience for me. Eugenio C still has a lot of followers, people that experienced her charisma and now try to recapture those moments on dozens of other cruises, but it's never the same. Well, that explains a lot! My name is Mariana and I was on that cruise in 1973 . 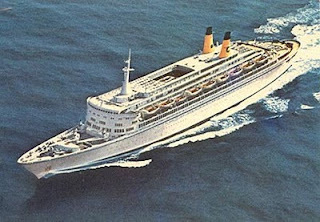 My first trip on the Euguenio was 1971 from BA to Naples back .My family and I have almost 20 season on this ship .ON my first trip I was only 5 so growing up on this ship make me have a special view of cruise ship. My last one was 1989 , end of the long 30 days trip to the Caribbean . I have a chance to this ship in Freeport in 2002 waiting to be sold . It was a happy and sad experience . Defenitely the Euguenio Costa was a wonderful ship ahead of its time . Hi. I just thought I would add a little story to this thread. Between being Eugenio Costa and Big Red Boat II , this ship was for a short time sailing for a U.K based operation known as Direct Cruises. At that time she was the ' Edinburgh Castle.' We did a cruise in 1998 to Iceland and Greenland on her. It was a life changing experience as well. Just beautiful up there. Some of the most fantastic memories. We got caught in a force 10/11 gale and you waited for the ship to ride the wave and then plunge down again. As testament to the quality of the build of the ship she handled the conditions brilliantly. But my story has a sad ending. When we boarded her I recall going to the pursers desk and hearing another passenger complain that some sort of oil was leaking through the ceiling of her cabin and onto her bed! Later in the cruise a whole lot of cabins flooded with raw sewage. It was just so obvious that without a total refit he wasn't going to make it especially against the likes of the new breed of ships that were entering service then. I still think she was so much more attractive than the newer ships that have come along since. Italian liners of the 60's..... the most beautiful liners we have ever seen. Someone should of saved her.